Manchester City have been linked with bringing two Belgian clubs into the City Football Group in recent times – top-flight side KV Oostende and second-tier club AFC Tubize. It had seemed that an agreement to secure 50 per cent of KV Oostende was the most likely, but that deal didn’t go through with Oostende sold recently to Belgian businessman Peter Callant. However, AFC Tubize, who City sent Ghanaian youngster Divine Naah on trial and then on loan to in the January transfer window, could still be linking up with Man City. 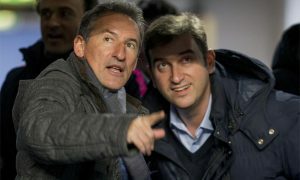 Tubize club president, Raymond Langendries, has confirmed publicly in an interview with L’Avenir that talks are ongoing between the two clubs that would see City, or more likely the City Football Group, invest in Tubize. Langendries insisted that nothing is decided yet but if a deal is struck, it will give the CFG another hub in which to develop and place talent. NAC Breda is currently City’s best option in Europe for those not ready for major leagues, but Tubize would give them another option at a slightly lower level.